BonitaJ.com has a wide variety of wedding jewlery for the whole wedding party. Even some goodies for the flower girls. Let us know what you would like from BonitaJ.com and you could win a $100 gift certificate. Best of Luck. Every piece of bridal and bridesmaid jewelry is handmade custom to your order specifications as each order is placed. For all of your bridal hair accessories and hair jewelry needs, BonitaJ.com has a selection perfect for you. 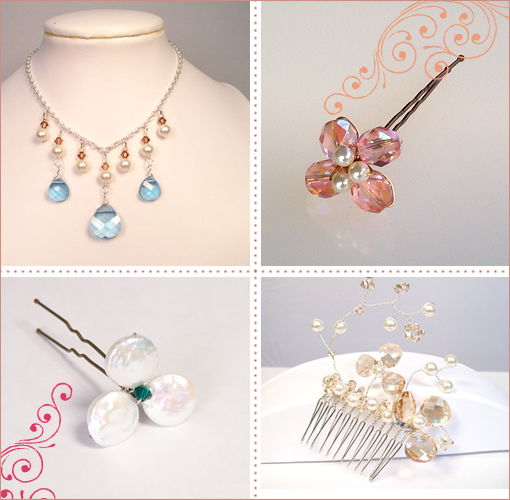 From pearl bridal hair accessories, Swarovski crystal hair accessories, flower bridal hair accessories, we have a bridal hair accessory to compliment your wedding gown and bridal look.